'The Atlas of Climate Change Impact on European Cultural Heritage' is comprised of a vulnerability atlas and its accompanying guidelines, which together reveal the effects of future climate variations on cultural heritage. This book arises from a European Commission 6th Framework Programme for Research project: 'Global Climate Change Impacts on the Built Heritage and Cultural Landscape – The Noah's Ark Project'. The work recognised that although climate change attracts wide interest at research and policy levels, little attention is paid to its impact on cultural heritage. In a period when enhanced regulation has improved European air quality, it seems important to explore how the threat of climate change to cultural heritage can become better recognised and perceived as relevant. As a non-renewable resource to be transmitted to future generations, cultural heritage includes the built heritage, artefacts inside buildings, archaeological sites and cultural landscapes. Rather than examining the fate of individual monuments, the 'Noah's Ark Project' took a strategic overview of the changing pressures on heritage. The results can now be viewed on a wide geographical scale, presented here as a vulnerability atlas and accompanying guidelines. This atlas aims to fill the present gap in studies on the effects of future climate variations on cultural heritage, producing maps that link climate science to the potential damage to our material heritage. The atlas gathers different types of maps and research outputs of future scenarios. Sections within the atlas include climate maps, displaying traditional climate parameters relevant to cultural heritage, and specific heritage climatologies; damage maps that quantitatively express the damage induced by climate parameters on building materials in future scenarios; risk and multiple-risk maps showing areas of increasing or decreasing risk across European regions; and thematic sections focusing on specific processes of damage that may arise from climate change. 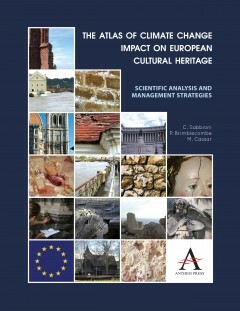 The atlas is also supported by key recommendations for policy-makers managing the impact of climate change on European heritage sites.